Circular window frames here and there, and none of the rooms is in a rectangular shape. However, while the unique style pleased and the size was fine, the interior layout left something to be desired. The house had two bathrooms, three bedrooms and an office but the location of the master suite on the ground floor, away from the rest of the bedrooms upstairs, was too isolated. Furthermore, the home, built in 1951 and remodeled in 1999, had a double-height living room with a catwalk — not the most practical use of space, nor very energy efficient. We tried to convert the home into a more family-friendly environment that would better suit homeowner needs. Simply adding on extra rooms wasn’t an option. The existing structure was already nearly maxed out on space, as per zoning regulations. 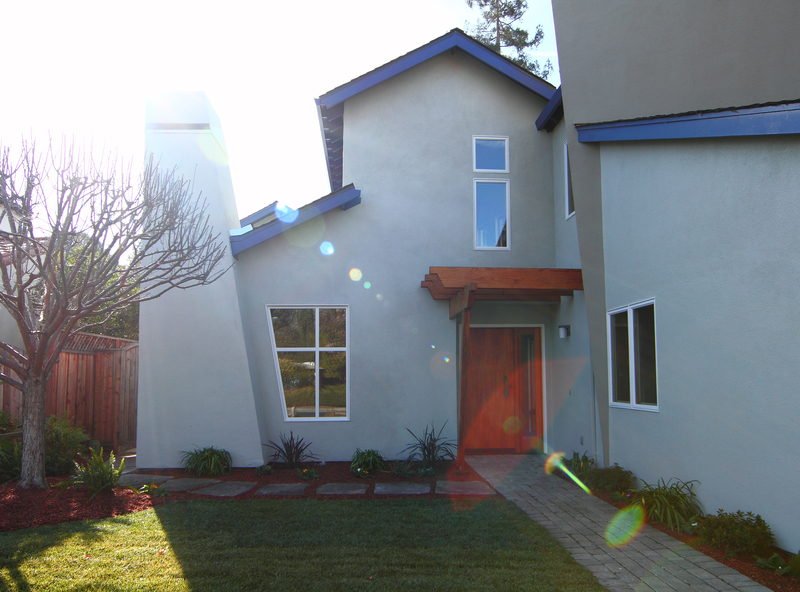 This contemporary home already stands out among its more traditional Mediterranean and ranch-style neighbors, we had to be sure the remodel would not have a drastic effect on the exterior of the house nor on the neighborhood character. We decided the best way to maximize space would be to cut the living room off at one story, thus creating a new master-bedroom area above it and converting the office into a luxurious master bathroom and walk-in closet. The ground-floor master suite could then become a guest room. The goal for the master bedroom was to comfortably fit a king-size bed and incorporate the existing catwalk and access to an attic. Several large windows let in plenty of natural light. One of the features the homeowners had always liked about the home was its unusual curved wall, extending from the front door to the back of the house, on both stories. That same curve added both challenge and inspiration to the designing of the new master bath. The contractors carefully placed small, white glass tiles separated by dramatic metal strips horizontally against the curved wall. They installed an elegant shower and marble bathtub with a shape reminiscent of a boat, perfect for a relaxing soak. Three tall windows facing the street were waterproofed and fitted with frosted glass, for privacy, while two others facing the neighbors were removed entirely. In keeping with the couple’s preference for a clean minimalist style, a neutral color scheme was maintained throughout. Gray concrete floors were added, plus a wall mounted double vanity featuring white porcelain sinks, man-made quartz countertops and streamlined cabinets of gray oak. Getting approval from the city was a big challenge. We hit some bumps, including mix-ups and staffing changes. It took nearly a year for the family to be able to move in. In order to add square footage to the property, a special home-improvement exception was needed, which is not easy to qualify for. We had to make our case not only to the city but to the neighbors and take pains to insure that the redesign would blend seamlessly.